We’ve recently had quite a few patients come in for second opinions after consultations where the doctor never even came in the room. Why does that even matter? In my experience, it totally matters. We have an excellent records technician who takes great photos and x-rays. And we have an awesome treatment coordinator who has presented thousands of treatment plans and has pretty much seen every condition in the book. Even some that weren’t! Every time we see a new patient, my records technician takes clinical photos and x-rays. Then, my treatment coordinator takes the time to review the records and get to know the patient before I do. She meets with me for a few minutes to look at the records together and come up with a ballpark treatment plan before coming into the consultation. Carrie is so awesome and experienced that more often than not, she already knows what treatment I have in mind and how long it’s going to take. But we always follow that up with a clinical exam before we present treatment options for two hugely important reasons. First, we want to have the opportunity to get to know you! Sure you might have come in on recommendation from your dentist, a friend, seen our videos or social media, but we would never expect someone to commit to a significant investment like orthodontic treatment without being totally confident in not just the treatment plan, but who’s actually doing the treatment! One of my professors in school told me, “Nobody cares how much you know unless they know how much you care.” It’s something that stuck with me and a principle of our practice. If the doctor doesn’t care enough to meet you or is just too busy, doesn’t that send a message? Second, as good as our records are, they just don’t tell the whole story. I couldn’t tell you how many hundreds of times Carrie and I have gone into a consultation with a plan that totally changed because of things that only came up in the clinical exam. TMJ and gum problems can only be found by a clinical exam, and patients can position their bites differently in photos than they do in real life. We’ve had multiple occasions where the photos suggested a huge problem requiring surgery and the clinical exam showed a much simpler picture. And vice versa. A treatment plan is only as good as the diagnosis, and if it’s just made from photos, you might as well go the do it yourself route. 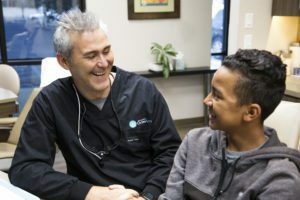 When your orthodontist is in a bigger hurry to take your money and put braces on than get to know you, what you want and what actually needs to be corrected, you might want to get a second opinion. If you’re ready to schedule a complimentary examination with Dr. G, you can call us at 661-829-7970, or click the button below and fill out our Consultation Request form. Our staff will quickly reach out to you to schedule your appointment. NOTE: The author, Dr. Jared Gianquinto, is an orthodontist in the private practice of orthodontics and dentofacial orthopedics in Bakersfield, CA. He was trained at Temple University and Naval Medical Center San Diego, completing orthodontic specialty training at Temple University and is past president of the Kern County Dental Society. Dr. Gianquinto’s unique combination of extensive past general/cosmetic and current specialty orthodontic practice qualify him an expert in two-phase treatment, extraction and non-extraction treatment, clear aligners (Invisalign), accelerated orthodontics and multiple bracket systems. The opinions expressed here are protected by copyright laws and can only be used with written permission from the author.